This is a super simple dinner that I made a while back. I had meant to share this ages ago, but life being what it is, I got distracted and didn't get to it. 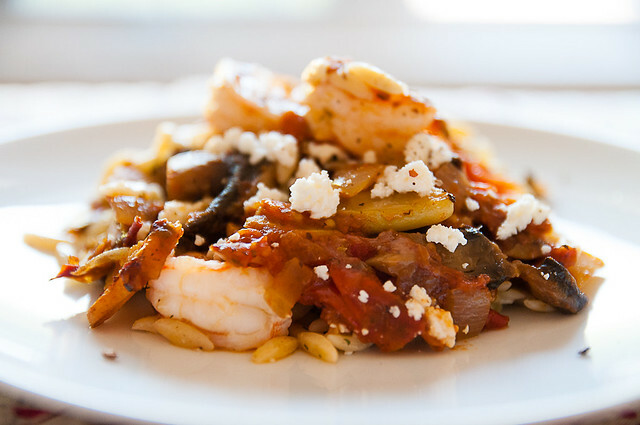 This dinner came about because I had some shrimp, feta and fresh organic vegetables from Bryson Farms that needed to be used, and in my googling/pinteresting, I came across this recipe from epicurious, that looked like a great base. The original doesn't call for much in the way of vegetables, which is honestly a problem that I find with a lot of casseroles. Personally, if I'm going to get everything together in a big dish and bake it, I want to have enough vegetables contained within it that I don't feel guilty if I can't muster my schmidt together enough to make a salad or veggies on the side. So I almost always add more veggies, and it almost always works out well. 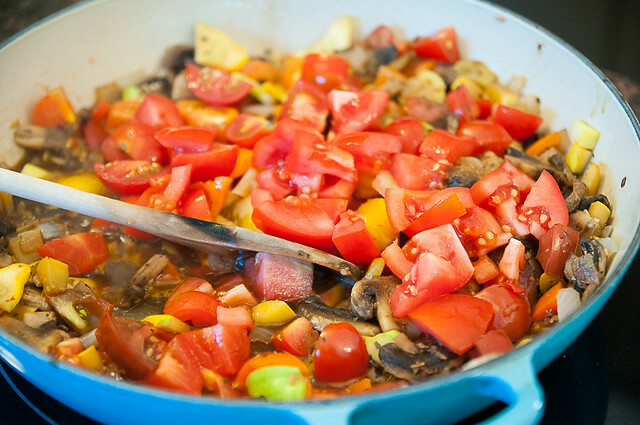 In this case, I used fresh tomatoes in lieu of canned, and also added mushrooms and summer and pattypan squash. They were great! 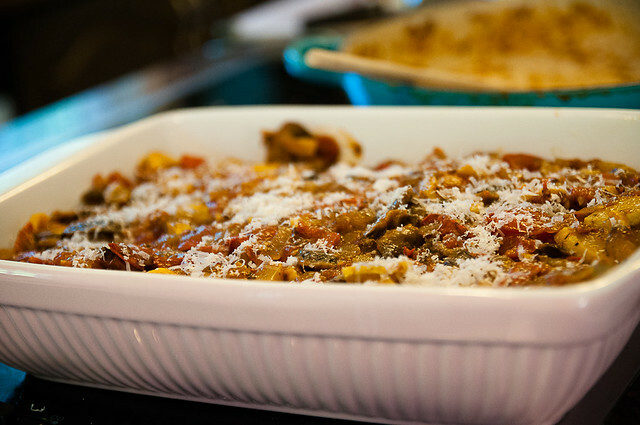 And the whole casserole had fantastic flavour, so I would recommend this. Orzo could easily be substituted with rice or quinoa or millet if you preferred. I have a weakness for orzo though. 1. Preheat oven to 400°F. Brush 11x7-inch glass baking dish with oil. 2. Cook orzo according to package directions. 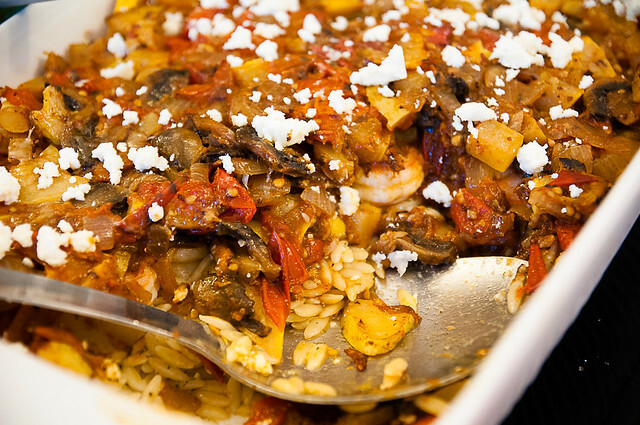 (when I have time, I like to toast the orzo first --> you can see the technique in this recipe). Drain well and return orzo to same pot. Add 2 tablespoons olive oil, 1/4 cup feta cheese, Parmesan cheese, and 1 T basil and stir. 3. Arrange orzo mixture in casserole dish. 4. Heat 2 tablespoons oil in large skillet over medium heat. 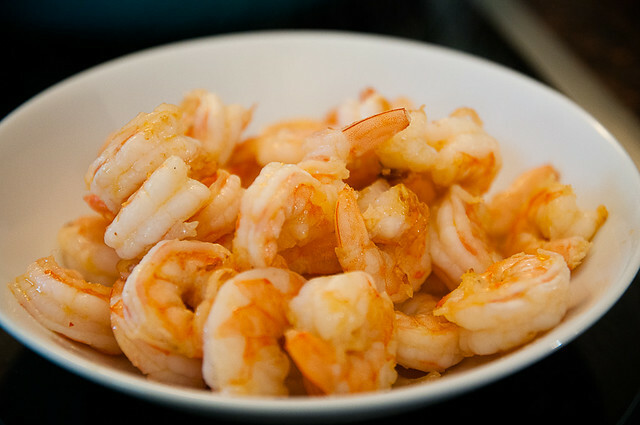 Add shrimp and sauté until slightly pink, about 2 minutes (shrimp will not be cooked completely). 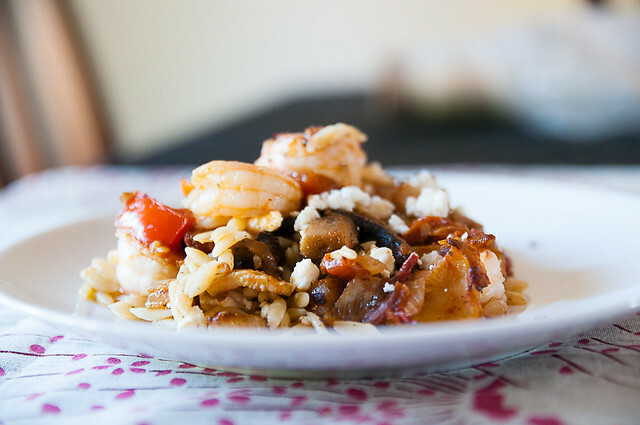 Arrange shrimp on top of orzo. 5. Add remaining 2 tablespoons oil to same skillet. 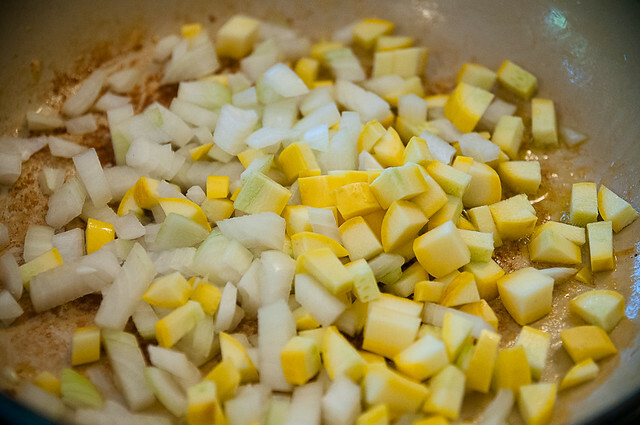 Add mushrooms and summer squash/zucchini, garlic and sauté over medium-high heat for 2-3 minutes. Add tomatoes with juice; cook 1 minute. Stir in vermouth and oregano and remaining 1T basil. 6. Simmer uncovered until the tomatoes start to break down about 5-7 minutes. Season sauce to taste with salt and pepper; spoon over shrimp. Add a sprinkle more parmesan. 7. Bake orzo until heated through, about 10 minutes. Sprinkle with remaining feta. This is so simple to make and is delicious. 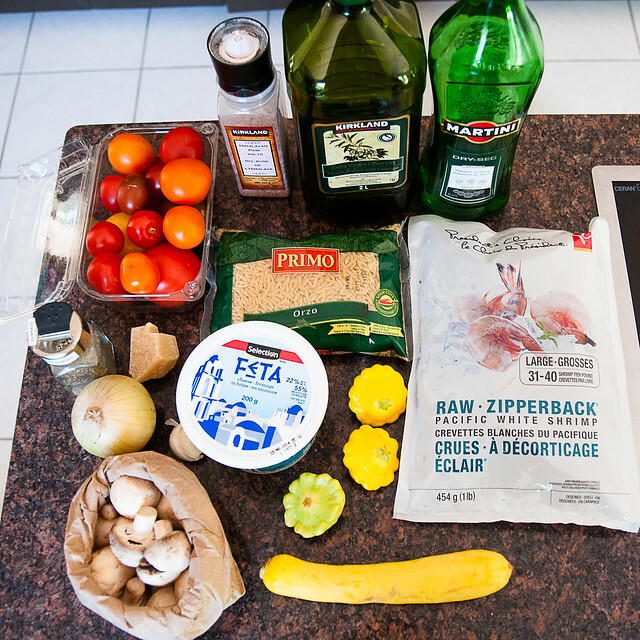 It could easily be modified to suit what you have on hand - chicken would work (though make sure it's cooked first), and you could mix up the vegetables to include peppers, fennel, eggplant, etc. This would also be good with goat cheese instead of feta (if you like goat cheese.....which I don't), and I think black olives would probably be a great addition too. This looks great! I am in a serious cooking rut and need some new ideas! I keep making the same old stuff. This sounds delicious! I wish I had some for my breakfast this morning!